She was the eldest daughter of Henry I, King of England and Duke of Normandy. She was born into a powerful ruling class of Normans, who traditionally owned extensive estates in both England and Normandy. Matilda was married at a young age to Henry V; after his death she was remarried to Geoffrey. Eleanor was then still the wife of Louis. Eleanor was the Duchess of Aquitaine, a duchy in the south of France, and was considered beautiful, lively and controversial, but had not borne Louis any sons. Louis had the marriage annulled and Henry married Eleanor eight weeks later on 18 May. The marriage instantly reignited Henry’s tensions with Louis: the marriage was considered an insult, it ran counter to feudal practice and it threatened the inheritance of Louis and Eleanor’s two daughters, who might otherwise have had claims to Aquitaine on Eleanor’s death. Meanwhile, back in England, the civil war lumbered on intermittently between Stephen and Matilda. On landing in England on 8 December 1154, Henry quickly took oaths of loyalty from some of the barons and was then crowned alongside Eleanor at Westminster on 19 December. The royal court was gathered in April 1155, where the barons swore fealty to the King and his sons. Sadly, Henry inherited a difficult situation in England, as the kingdom had suffered extensively during the civil war. In many parts of the country the fighting had caused serious devastation, although some other areas remained largely unaffected. Numerous unauthorised, castles had been built as bases for local lords. The royal forest law had collapsed in large parts of the country. The king’s income had declined seriously and royal control over the mints remained limited. Clearly, Henry II had a lot on his hands … and a new income stream (from Ireland) would greatly improve his chances of funding and winning a war in France – a war he had to fight in order to hold on to his own family’s lands and those of his new wife, Eleanor. Count of Anjou, Brittany, Poitou, Normandy, Maine, and Gascony. He also claimed Aquitaine through marriage to the heiress Eleanor in 1152. Henry’s many French possessions caused him to live for more than half his reign outside England. It was essential for him to establish a judicial and administrative system which would work during his absence. Henry seemed unwilling to entrust any of his sons with resources that could be used against him. Richard was dispatched to Aquitaine to punish the barons who had fought for him. After Richard had subdued his rebellious barons, he again challenged his father. From 1180 to 1183 the tension between Henry and Richard grew, as King Henry commanded Richard to pay homage to Henry the Young King, but Richard refused. Finally, in 1183 Henry the Young King and Geoffrey, Duke of Brittany, invaded Aquitaine in an attempt to subdue Richard. Richard’s barons joined in the fray and turned against their duke. However, Richard and his army succeeded in holding back the invading armies, and they executed any prisoners. The conflict paused briefly in June 1183 when the Young King died. With the death of Henry the Young King, Richard became the eldest surviving son and therefore heir to the English crown. King Henry demanded that Richard give up Aquitaine (which he planned to give to his youngest son John as his inheritance). Richard refused, and conflict continued between them. Henry II soon gave John permission to invade Aquitaine. In 1188 Henry II planned to concede Aquitaine to his youngest son John. The following year, Richard attempted to take the throne of England for himself by joining Philip’s expedition against his father. On 4 July 1189, the forces of Richard and Philip defeated Henry’s army at Ballans. Henry, with John’s consent, agreed to name Richard his heir apparent. Ireland was clearly an important territory for Henry II and, more importantly, it was a ‘green field’ site for economic exploitation insofar as if he granted his vassals land there, they would be obliged to pay him taxes and provide services in return for the favour, i.e. the feudal system at work. Henry II. 1154-1189. AR Penny (19mm, 1.46 g, 8h). 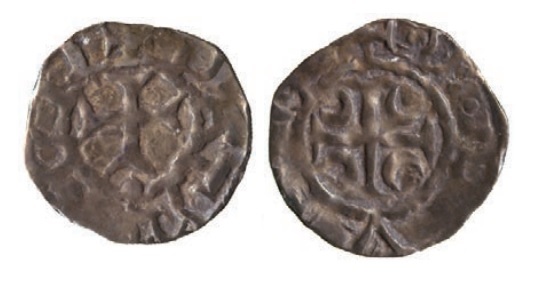 Cross and Crosslets (Tealby) type; class D. London mint; Æthelwine, moneyer. 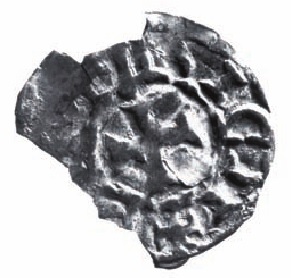 Struck circa 1167-1170. + ҺENRI : [ … ], crowned facing bust, holding scepter / + [ … ]ALPENE [ … ]:, cross pattée, with crosslet in angles. Eleanor was the daughter and heiress of William X, duke of Aquitaine and count of Poitiers, who possessed one of the largest domains in France—larger, in fact, than those held by the French king. In July 1137 married the heir to the French throne, who succeeded his father, Louis VI, the following month. Eleanor became queen of France, a title she held for the next 15 years. From 1147 to 1149 Eleanor accompanied Louis VII on the ‘Second Crusade’ to protect the fragile Latin kingdom of Jerusalem, founded after the First Crusade only 50 years before, from Turkish assault. Eleanor’s conduct during this expedition, especially at the court of her uncle Raymond of Poitiers at Antioch, aroused Louis’s jealousy and marked the beginning of their estrangement. After their return to France and a short-lived reconciliation, their marriage was annulled in March 1152. Just two months later she married the grandson of Henry I of England, Henry Plantagenet, count of Anjou and duke of Normandy. Henry II had five sons and, unusually, he ruled England jointly with his second son (Henry the young king). Next in line were Richard, Geoffrey and John, respectively. After Henry II fell seriously ill in 1170, he put in place his plan to divide his kingdom, although he would retain overall authority over his sons and their territories – something that caused great resentment and led to several plots against him by his sons – aided first by Louis VII and then by Philip II, kings of France. At only three years of age, he was betrothed to Margaret, daughter of Louis VII of France and his second wife, on condition that Margaret’s dowry would be the Vexin, the border region between Normandy (then held by England) and France. Henry II took advantage of Pope Alexander III’s political difficulties to secure the Pope’s permission for the children to be married in 1160. On June 14, 1170, the young Henry was crowned king (theoretically to rule in association with his father) at Westminster by Archbishop Roger of York. York’s officiation, usurping a prerogative of the archbishop of Canterbury, exacerbated the dispute between the latter, namely, Thomas Becket, and Henry II, which ended with Becket’s murder six months later. Crowned again on Aug. 27, 1172 (this time with Margaret), the Young King received no share of his father’s power. With his mother and his brothers Richard (the future Richard I) and Geoffrey, he nearly overthrew Henry II in 1173. Forgiven for this revolt, he intrigued further against his father with Louis VII. In 1182–83 he waged war against Richard over Poitou, and he was preparing to fight Richard again when he died in France of dysentery. He was stamped to death in a riding accident during a tournament in 1186 in Paris. 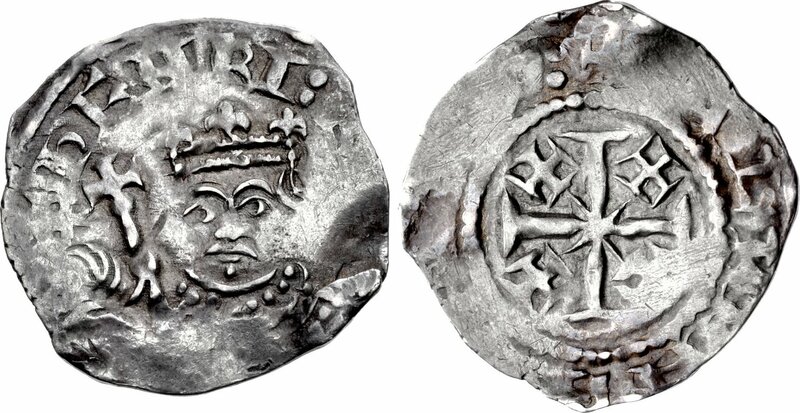 John’s second and third Irish issue as Lord of Ireland occurred after Henry II died, i.e. during the reign of his older brother, Richard I (the lion heart). Two distinct types were issued. Hugh De Lacy was a leading figure in Henry II’s invasion of Ireland in 1171 and, as his most trusted knight, was left in charge when Henry II left. 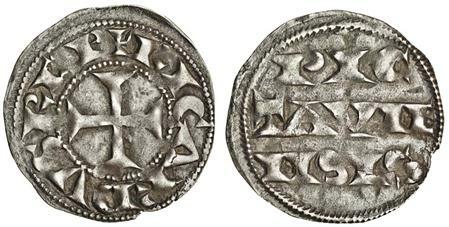 Hugh de Lacy served three times as Lord Deputy of Ireland and did much to break the power of the native Irish High Kings and enhance Anglo-Norman influence but he did not issue coins in his own name. However, it soon became apparent that several of Henry’s trusted knights were increasing their land holdings (and power) via further conquest and strategic marriages. This alarmed Henry, so he made his youngest son (John) King of Ireland and sent him over to Ireland to receive homage from both Norman and native Irish rulers. John’s first expedition to Ireland was a disaster from a number of viewpoints – political, military and financial. John de Courcey was left in charge of Ireland. John de Courcey became the most powerful lord in Ireland, when he conquered and held the provinces of Ulster and Connacht. This caused more than a little jealousy amongst his peers in Ireland and when John left Ireland in December 1185 and returned to England, Henry II granted the office of justiciar to the Baron John de Courcy, who had massive influence in Ulster. 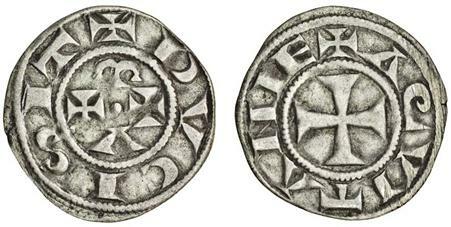 Between 1185 and 1185, de Courcey issued coins.